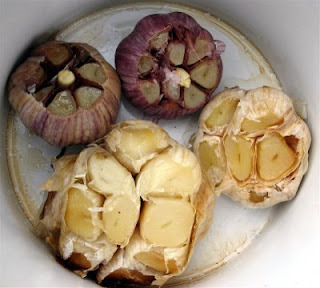 Roasting the garlic heads in my mini slow cooker. While I love the aroma of garlic, not everyone here at home appreciates it. Using the slow cooker outside keeps my family happy and my neighbors intrigued! Simply cut a slice off the top of each head to expose the cloves, brush the tops lightly with olive oil, place in the slow cooker, cover and roast until easily pierced with a fork, 4 to 5 hours on high. To use, just squeeze gently and the cloves will pop out. Roasted garlic has a mellow flavor that is delicious spread on toast, in hummus, used in bruschetta topping, or added to mashed potatoes. 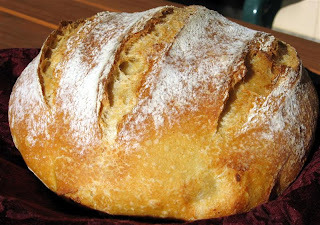 Whole roasted garlic cloves were kneaded into this rustic loaf of bread.